I recently met an investment banker who was telling me how he felt Gold would crash and didn't agree with my optimistic views on Gold. He quoted Mr. Warren Buffett and told me how he never believed in investing in Gold as it was a non-productive asset. People simply bought it and kept it in the locker, in hopes that prices went up. I have great respect for everybody, specially people like Mr. Buffett who inspire millions to be wealthy investors. However, being inspired doesn't mean following anybody blindly. You can't create wealth if you blindly follow others, in fact you need to believe in yourself and create your own path. Gold might not be a productive asset on its own, but tell me is a Rs. 1000 note a productive asset on its own? It is a store of value and can be exchanged for a productive asset. Gold is just like that Rs. 1000 note and is a store of value. This investment banker friend of mine went on to say, how the IMF would be selling Gold and how prices will head downwards. I don't like to argue with people who have made up their mind and are closed to new ideas. There isn't any sense in winning arguments, as investing isn't about personal ego and proving who is right and who is wrong. At the end of the day, the person who creates wealth is right. Time is the best judge. My advice to all fellow Happionaires is to follow this principle when it comes to investing and never give advice to those people who don't respect your advise. Why waste our time giving knowledge to those who don't respect Saraswati? We all know what happened to those who didn't follow our ways in the past, they lost out valuable opportunities. The same thing is once again going to happen with those who don't look at Gold today. Large insider investors love playing games with the masses. They control their psychology and minds and make them feel helpless. By now all fellow Happionaires here would already know about these games. First they spread wrong information about how prices are going to crash; they might even sell an asset in small quantities to actually make prices fall a bit. The masses panic and rush to sell, pushing prices down even further. The insider investors start buying while the masses sell in a panic. Only to realize that after a few months prices of the same asset double. I have seen this game being played over and over again. Gold is seeing the same game being played. The information I have on gold makes me extremely confident on it. I wouldn't be able to share everything on it here, as one would need to understand the history of Gold and the true reserves of it on our planet. But besides me there is a small minority who already know this, and anyone having such information will certainly want to own gold. The real world teaches us much more than sitting on a laptop. I will give all of you a small task to find out the real situation of gold. Find out what is the price of a 20 gram gold coin from your local banker or jeweller. Compare that to the price of gold being quoted on the gold ETF or in the mass media. Is there a major difference? Now just to see how rare supply of gold is, just try finding out if larger quantities of gold are available. For instance try finding out if you can buy 100 kilograms of gold and at what price you will get it. You might not wanting to buy that much gold, however you will get an actual idea about how much supply is there and if people are willing to sell. The real world will always tell you the truth. Do you agree? Share your views in the comments section. Keep smiling and never stop learning! Happionaire Education and Training Is Here. Find Out Which Programs Suit You The Best. 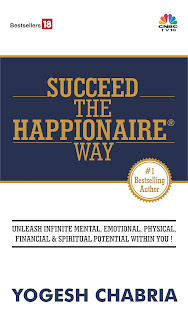 I have been investing for long and been a follower of the Happionaire way of life and investing for over a year now. I have noticed how what you say works in the markets. It is fascinating to see that almost everything follows a similar pattern. I am buying gold gradually. Also congraulations for Happionaire Education! Would surely love to be a part of these programs and also meet you in person. I dont really get it... as suggested by Yogesh, i looked at the price of a 10g coin of gold in the market and compared it with the NAVs of the gold ETFs, and i though that there was no major diference...can somebody help me understand?? Excellent step in providing Happionaire education. I have enrolled myself and am looking forward to attending it. I have got excellent returns thanks to the advice here and I am looking forward to more. Saurav a 20g coin of gold is costing over Rs. 33,000 while on ETF one grame is around Rs. 1435. See how much cheaper the ETF is. Better to buy ETF now and wait gold prices to go up. Very good strategy suggested by Yogesh. which GOld ETF is better ? The price of Reliance ETF seems to be lowest, so does it mean its better or is it the other way ? Congratulations for the Happionaire Education Initiative. It is much needed and thanks for listening to us. I will surely love to attend it. Samant according to me best if Goldex-Benchmark because you can buy larger quantities and sell it. More liquidity is there. I have been buying sizable quantities as I already made the cash because of one company shared in Cash The Crash that doubled and another report shared earlier. I agree with Mr.Chhabaria. Gold as a asset class is a good investment and hedge against risk of value erosion in all kind of economic scenerio-inflationery or deflationery- Boom or Doom. With Slowly but gradually US$ losing confidence level of central banks worldwide, Gold will have more attention of central bankers as reserve "currency"
Umesh/Falgun how to buy an ETF? I have a trading account. When I serached the BSE website scrips I coluld not see anything alled "GOLDEX BENCHMARK GOLD". please suggest. I have read your books and have started investing albeit in a small manner. I have also purchased some of your reports online (although the stock recommended has not moved up, but I am holding onto the stock). I am still convinced of this way of investing. Would love to learn more about investing and be part of the program. Every time i see you coming with more fresh knowledge i be more happy and happier. All the Etf's are located on nifty and major volume traded fund is GOLDBEES. Reliance and kotak are not even half in volumes compared to goldbees. i am accumulating gold very aggresively at current prices. Thanks once again for sharing true knowledge with all your followers. Trust your guru who gives Saraswati and Laxmi will always come is what I have learnt. I made over 80% (i invested little later) by the report you shared and am very eager to attend the education programs. Have sent an e-mail. I have been buying Gold too. Always follow the Guru. ETF can be bought just like a stock on NSE. Don't worry my fellow Happionaire Sudin. Buy it we are all here to support each other. Falgun - what you mean is that one should buy gold ETFs since they are lower priced than physical gold coins and since the price of gold is going to go up in the near future. Am i correct in this interpretation? Saurav a gold coin today costs more than ETF. When gold goes up both of them will shoot up. But now but the ETF as it is cheaper. and I already pre-booked myself am really looking forward to learning more and meeting Mr. Chabria and other Happionaires! I feel Yogesh Chabria is a great personality, as he is revealing the secrets of becoming rich.Very few people in this world are so great and kind .His books 'ITHW' and 'Cash The Crash' have helped me to develop an optimistic attitude. A big 'Thank You' for spreading the rays of awareness and Financial Literacy. Gold rallied to settle above $940 an ounce as a safe haven investment option as the dollar declined against major currencies and on news that China is considering a new global reserve currency. August gold futures settled up $13.90, or 1.5%, at $941.30 an ounce on the COMEX division of the New York Mercantile Exchange. Spot gold traded at $941.05 an ounce at 2:31 pm EDT, up from $925.85 quoted late in New York on Wednesday. China, on Wednesday, asked to debate proposals for a new global reserve currency at next week's Group of Eight summit in Italy. There were recent signs that China, which holds vast reserves of US currency and Treasuries, was considering a reduction in its exposure to the dollar and to US assets in case America's ultra-loose fiscal and monetary policy rekindles inflation and erodes the value of the dollar. However, analysts said it was unlikely that the dollar's reserve currency status would be challenged in the near future. Besides, long-term inflation expectations were boosting gold's appeal and further data reinforcing those views would help the metal to build on its gains. Holdings by the world's largest gold-backed exchange-traded fund, the SPDR Gold Trust, fell by 5.19 tonnes to 1,120.55 tonnes as of June 30. The holdings are down 13.48 tonnes from a record high on June 1. In other precious metals, spot silver rose to $13.74 an ounce against $13.57 in New York, while platinum gained rose to $1,200 versus $1,172.50 previously and palladium climbed to $252 from $248. P. Dave - You are being too kind with your words and no one can always be right. Everyone makes mistakes and we can learn only if we make mistakes. I guess I have learnt as I have made several mistakes in the past as someone just starting out with very little money. I would be looking forward to having you in the Happionaire Education Programs. Saurav, Falgun has replied to your question very beautifully. Samant more or less all ETF products are the same. Look at volumes - so that you will have an exit option in the future. Umesh- great to know that you have benefited from the knowledge shared in Cash The Crash. I would be looking forward to seeing you at our Happionaire Education Program. Anil - You have analyzed the situation very well. As Amar posted a link, it shows how gradually people are moving towards Gold. To create wealth we need to take action before the masses and have patience. Sudin - Buying an ETF is just like buying a stock on NSE. Find the code and you can buy any desired quantity. Uma - Real wealth gets created over time. I have always experienced that the best investments I have ever made have been in knowledge. Amar - It is always nice to see the followers of the Happionaire way doing their own research and sharing it with others. I would like to thank you for the wonderful data shared by you. This knowledge is truly powerful. Saurav, Santosh has answered your query. Thanks for the kind words Jasmine. Sudin can not see "GOLDEX BENCHMARK GOLD" on BSE web site bacause the Benchmark ETF for Gold was listed only on NSE Web site. Try seraching for it on NSE Web site, my Dear Friend. About Gold.. i feel either ways..America will win !! I think they have vast amount of land with "RICH Natural resources" be it oil or GOLD, which is not tapped. Its a country with vast amount of untapped resources...my opinion is America is creating a artifical fall ..just to open its cards later (10,20 yrs down the line). Gold reserves in USA is definitely high (both geologically mined and not yet mined). Thanks again for your financial service to mankind ! I am sure this blogsite and the comments will serve as education series in itself ! Yogeshbhai, show me how has gold appreciated in the last 15-20 years.Substantiate your explanation with examples.Only then will I be satisfied. Gemini, that exactly is the point. Gold has underperformed in the past two decades. And if you read Yogesh's views, he clearly said that the best way to know what is right and wrong is to have patience. No need for him to prove anything, let us just wait and see what happens. Gold futures witnessed gains on Thursday on a decline in the dollar against global majors on weak economic data in the US. However, weak investment demand and inflation worries might see prices of the yellow metal going southwards. August gold futures settled up $6.90 at $916.20 an ounce on the COMEX division of the New York Mercantile Exchange. Spot gold traded at $915.80 an ounce at 2:25 pm EDT, against $908.45 an ounce late in New York on Wednesday, when gold sold off in line with other commodities on fears of stricter US government regulation of markets. The dollar fell sharply, giving back some of Wednesday's gains as investors ventured back into equities, denting interest in the currency as a haven from risk. Stock markets edged higher after a five-day losing streak, industrial commodities such as oil and base metals gained and currency markets became less cautious, suggesting heavy risk aversion may be abating. Demand for gold investment products such as exchange-traded funds – a major support of prices earlier in the year amid volatility in other markets – remained sluggish, however. Holdings of the world's largest gold ETF, the SPDR Gold Trust, declined more than 10 tonnes on Wednesday, while those of ETF Securities' ETFS Physical Gold product slipped 12,500 ounces 0.4%. Among other precious metals, silver was at $12.89 an ounce against $12.84, platinum was at $1,106.50 an ounce against $1,096, while palladium was at $234.50 against $231.50. Both metals are used primarily in car manufacturing as a component in catalytic converters. Traders of palladium were upbeat about news from China that its passenger car sales rose 47.7% in June from a year earlier. Yogesh Sir ,Awaiting your next book very anxiously..
over so the book has lost relevance for me atleast for today. Coming to the topic of this thread, I do have little investments in Reliance Gold ETF. However after reading your post my interest in it got renewed. So, I checked the Gold ETF prices on Mutual Fund websites and found out that there is minor difference in their performance. But Reliance Gold ETF has a bit more difference in its category. I didnt understand the reason behind this difference so I read the Scheme Information Documents of Reliane and and Kotak. To my surprise, it is explained there that 1 unit of MF closely represent 1 gram of gold AT THE TIME OF ALLOTMENT. The capitals letters are very important because in Relieance's SID (page 36) it has illustrated an example that showes that they deduct the expenses from the to run the fund. I realised that these ETFs are selling the physical gold to meet the expenses ! So over the time One unit becomes less and lesser from 1 gram of gold. Now in such scenario, is it really advisable to go for Gold ETF ? Or it would be better to buy raw gold ? I think it would be nice if you try to understand that Yogesh has always tried to answer to our questions here and through his writings. Please do not say such things and offend us fellow Happionaires who have benefited so much from the knowledge being shared here. I would request the moderator to try and restrict such negative comments. People should understand that Yogesh must be very busy as he has much more to do also. Let us learn to love and appreciate each other. I liked the fact that you posted details on Gold prices JAWNSIN and I think you are being just too passionate to hear our Guru. I can understand your passion but please have faith and respect. I see the industry posting good results despite the slowdown mainly due to better operating efficiency. Around the globe it is happening almost the same way. It look like there is enough liquidity in the system and how will people go for gold, when actually the equity is raising/stabilizing? Or is this up-run of equity too a boasted one? Could you please share your understanding of the situation? It is great to see so much passion always and I apologize from the bottom of my heart if I have not been able to reply to questions posted by fellow Happionaires individually. But I assure you that almost all the questions asked have been addressed through my writings or in previous blog posts and comments. When you read those, I am sure you will find answers. For instance even in the past I have mentioned how physical gold (in multiples of 10 gm. coins preferably for easy liquidity) is much better than an ETF for the longer term. At the end of the day you need to be in full control of the gold. Better to buy hundred 10 gm. coins, rather than 1 bar of 1 kg as it is always easier to sell small units in parts. Regarding better results, in India many of them have been due lower raw material costs, input costs and short term layoffs. I have always been very optimistic about India. The reason Gold will rise is not because of any problems with India but because of the problems in USA. In USA results of many large banks and investment firms have been manipulated with the help of SPV(Special Purpose Vehicles) where losses and liabilities are transferred to offshore companies in places like Cayman Islands and British Virgin Isles. Just have patience my friends. If you remember when markets were down and we were one of the few voices screaming out to buy? Most others were telling us not to. Today it is the reverse. Knowledge isn't something that is useful only during a Crash - it is eternal. My studying and reading about Crashes dating over from 500 years ago has made me realize that they all follow similar patterns and will continue to do so in the future. In fact thanks to technology and the fast speed at which money moves now, Crash will be even more intense. Gold has rallied for the last few days. I was planning to buy some more gold. Would you advice me to wait so that it corrects a bit or go ahead and buy now? I am very bullish on gold after reading your post and also doing some analysis on my own. I am however a bit sceptical about generating returns while investing it in Non-USD currencies. Before I begin let me say that I have decent holding in Gold and hence am not just discussing it here for sake of discussion. The price of gold in last few weeks for example has risen more in USD than in other currencies such as INR. This is understandable considering the fact that RUPEE is appreciating against Dollar (for obvious reasons). Gold ETFs and physical godl price did rise but not in line with the price rise in USD. So when we read about the gold targets to 1500 USD etc., one question that comes to my mind is: I am not a USD currency user. I am going to invest in INR so how much could my return be? If Rupee goes north of 45 (e.g. to 42 or 40) against dollar (last's say 10% rise from current level which seems quite likely) then how much will we gain via investing in Gold. I hope I have made my query clear. But the problem is that my analysis and thoughts may not be complete. So please shed some light on this aspect as well, if you can. Very efficiently written information. It will likely be precious to anybody who usess it, including myself. Keep up the good work – for positive i'll try more posts.